Nothing says Christmas like a well-decorated house — even if it’s one you can eat. 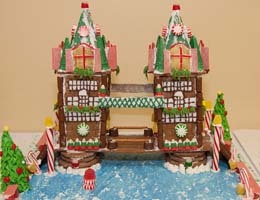 From candy-covered columns to frosting encrusted windows to ice cream cone turrets, the gingerbread village was created by Tidewater Community College culinary arts students during their Introduction to Baking course (HRI 128). Merry Maison, White Chapel Christmas, The Sunshine Inn and The Christmas Castle are just some of the homes in TCC’s neighborhood of more than a dozen delectable creations. 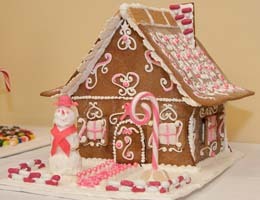 The gingerbread masterpieces are being auctioned by Children’s Hospital of The King’s Daughters. The houses are available now at https://squareup.com/market/chkd-magnolia-circle. If you are short on space in your home, consider donating a home for the children of CHKD and spread some holiday cheer.